This chronology includes events that occurred on 2nd of May , 2014 in the area of Kulikovo Field and inside the House of Trade Unions and describes events from when activists started to gather at Kulikovo Field at 2pm until the end of forensic experts work inside the building was over the next day at 3pm. Also there are key points of events held in different parts of city, were listed here. The chronology of the facts set out solely based on such facts that the Group believes to be reliable and is not contrary to other known facts and circumstances. The document contains no comments, estimating judgments, interpretations and other possible subjective assessments of the authors. 14:30. Supporters of two opposite sides start to gather in the central part of the city. “Chernomorets” and “Metallist” football teams’ fans, pro-Ukrainian organisations’ activists from Odessa and other cities gather at Sobornaya square, unorganised eurointegration supporters who are getting ready for the “Unity of Ukraine marsh”. Kulikovo Field activists, mostly “Odessa squads” gather at Alexandrovsky avenue and Zhukovskogo street in order to impede the marsh. 15:31. Clashes between “Kulikovo Field” avtivists and “Unity of Ukraine Mars” supporters start to occur around Grecheskaya square, which lays in the central part of Odessa. 18:00. Second part of football game “Mettalist VS Chernomorets” begins. Tribune of Odessa “Ultras” gets empty: partly they force towards the place where clashes are happening, other part is moving to other tribunes of a stadium. 18:30. Active phase of clashes is coming to an end around Grecheskaya square. One group of “Kulikovo Field” activists is blocked in shopping canter “Athena”, another group was squeezed out towards Preobrazhenskaya and Bunina streets. There are many pro-Ukrainian activists that are chasing running away opponents along Sobornaya and Grecheskaka Squares, Grecheskaya, Deribasovskaya and Preobrazhenskaya streets, Vice-Admiral Zhukov and Krasniy Lanes. 18:25. “Council of Public Safety» head Mark Gordienko urges supporters of Euromaidan to move towards Kulikovo Field. 18:45. “Chernomorets VS Metallist” football game is coming to an end. Big amount of fans are walking out of the stadium and moving towards Kulikov Field. 18:50. At the intersection of Preobrazhenskaya and Grecheskaya streets, a head of regional organisation of political party “UDAR” Andrey Yusupov urges Euromaidan activists to move in the direction of Kulikovo Field. Unorganised movement of big groups of pro-ukrainian actisists begin they are moving along Bunina, Ekaterinenskaya, Rishelyevskaya streets, Alexandrovsky lane towards Kulikovo Field. During the marsh activists are chanting slogans and breaking the advertisement light boxes of pro-Russian pre-election agitation of Odessa Mayor nominees. 14.00 A concert for veterans of Afghanistan war was announced to begin at 15:00. The number of spectators was about 100 people. Around 16.00 Antimaydan’s «Mobile unit» commanded by Vitaly Budko («Boatswain») arrives by the minibus Ford Transit with vehicle registration tag AN6852EO to the Grecheskaya square and later takes an active part in the clashes. 16.35 Organized group Antimaydan actovosts from so-called “Peoples Squads” are walking along Alexandrovsky Avenue towards Grecheskaya square. At the crossroad of Bunina street and Alexandrovsky Avenue the group is attacked by the people from self-defence. After a brief clash Self-defence is chasing the opponents along Alexandrovsky avenue. Majority of them return at Kulikovo Field. 16.50 A group of activists from the Antimaydan “Orthodox Cossacks” is driving towards Grecheskaya square by car Chrysler with registration tag VN5510VÌ. At 16:50 at Alexandrovsky Avenue, activists from the nearby headquarters of the “Council of public security” organisation block the vehicle and require from police officers to examine its’ content. They find hunting knives, traumatic pistols and pump action shotguns inside the car. 16.40 Evromaydan Self-defense leaving Alexandrovsky Avenue and moving toward Kulikovo field from Bunina street along Ekaterinenskaya street. Self-defense group is turning back at the crossroad of Uspenskaya and Ekaterinenskaya streets and returns to the Grecheskaya square area. Between 17.00 – 18.00 Antimaydan supporters continue to gather at Kulikovo Field. Participants are trying to make a decision concerning further actions in different ways including voting. 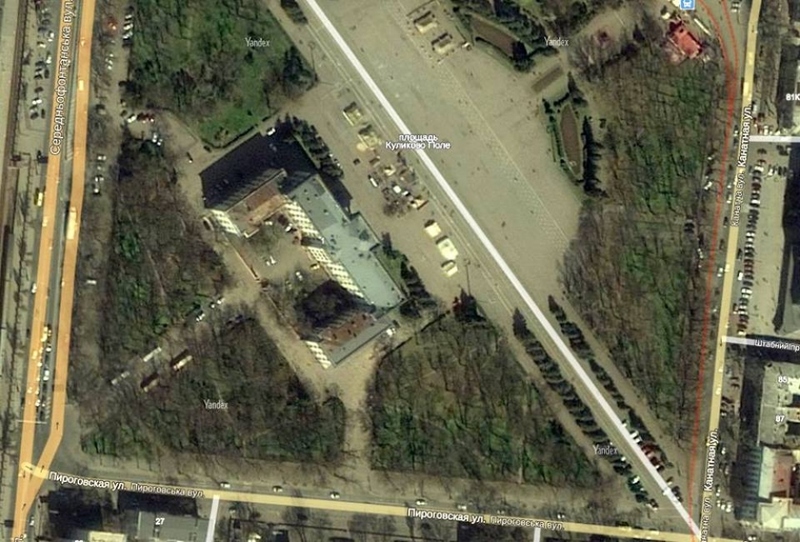 18.00 Kulikovo field There are reports from Grecheskaya square about dead participants of Antimaydan grop. Artem Davidchenko among the small group of people is walking to Grecheskaya square. There is a proposition arrives: either people should be dismissed or women and senior people should leave and men should take their positions in Trade Union Building and defend them. People at Kulikovo Field (mostly elderly women) remain at the square. Around 18.20 Grecheskaya square Active phase of the clashes ends. Around 18.20 Group of linear control of transport police at the Odessa-main station, which is located nearby Pirogovskaya and Srednefontanskaya streets, receives an order to arrive urgently to Grecheskaya square area so it leaves Kulikovo Field. After 18.30 Chaotic groups of participants in the clashes at Grecheskaya square are returning to Kulikovo Field. Though one group which includes Vitaly Budko, urges people to leave the square, but participants partly remain at a site. Around 18.40 Defenders of the tent camp speak to a guard of Trade Unions building with an ask to hide crosses and icons, which were in tents of Orthodox organization. The guard takes the church things and locks the door. Around 18.50 Those who gathered at Kulikovo Field, make the final decision to use the building of Trade Unions in order to defend. 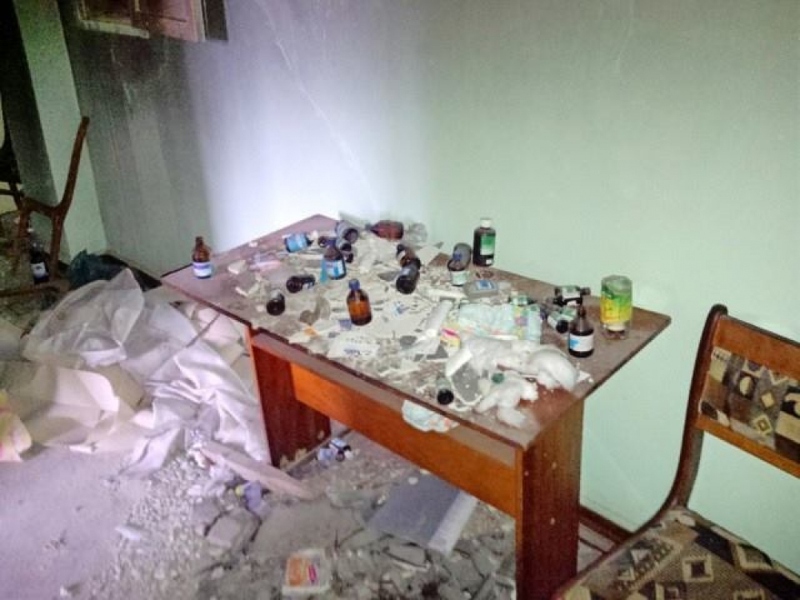 They burst open the entrance doors, breaking the panel, and start to move things from tent camp (electric generator, gasoline canisters, drawers with Molotov cocktails and cans of ingredients for producing them, mattresses, medicines, promotional materials and personal belongings) into the building. They pull sand bags, boards, wooden pallets, previously used for fencing the perimeter of tent city, to the porch area. Also they put stones into the bags which they later move to the stairway windows, at the roof and into few rooms at the 2nd and 3rd floors. In the hallway of the second floor they arrange an improvised hospital, they put down matrasses, bring in bandages and medicines. Also people prepare a first-aid room in the cabinet #432 in the northern wing of the building. Between 19.00 and 19.20 A small group of Kulikovo field activists takes defensive position behind the barricade which was built directly in front of the central entrance porch of the Trade Unions building. Artem Davidchenko enters the building, but then together with the Chief Editor of «Info Center» Eugene Anohin leaves the Kulikovo field by a white car. 19.20 Groups of football fans and Euromaidan activists are starting to dismantle tents and destroying property in them. From the very first minute of the clashes opponents are using stones, flares and Molotov cocktails. 19.20 In one of the tents there is a man with an axe and a sapper shovel who is attacking pro-Ukrainian activists and afterwards running away outside the square area. 19.23 From the roof and façade Windows of Trade Unions building people are throwing stones, Molotov cocktails and flares. In response to that Molotov cocktails being thrown towards the barricade at the entrance of the building. Around 19:25 Both sides are actively using improvised incendiary (bottles and missiles). One of the tents is starting to burn. 19.30 There are three burning tents at the site, pro-Ukrainian activists dismantle the stage. Unidentified persons on the roof of the Trade Unions building continue to throw Molotov cocktails onto the square. People are throwing Molotov cocktails from the square to the barricades at the central entrance and towards the windows at the second floor. The defenders fire from multiple firing positions particularly located at the roof and rooms at the 2nd and 3rd floors of the building. 19.30 Chaotic group of five Chernomorets football team fans is entering to the courtyard of the building and through a door in the right (Southern) inner corner seeps into the building. 19.31 Rescue service People begin to report about the fire in the tent camp at Kulikovo Field to the Emergency telephone 101. 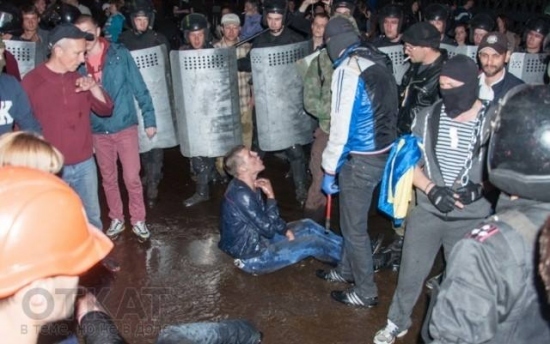 19.32 Odessa City Police Department, duty unit Information from the surveillance cameras about mass violation of public order at Kulikovo Field with about 1000 participants was received in a duty unit of Odessa City Police Department. 19.33 There are 5 tents burning in a tent camp. In one of those tents there is an LPG cylinder. Part of the barricade in front of the Trade Unions building takes fire. People at the barricade continue active defence, using homemade grenades — firecrackers filled with striking features. 19.34 Duty operator of City Emergency Services (CES) reports to the Deputy of CES Gubay V.V. about the fire in the tent camp. There are five more messages about the fire received by the telephone service 101 until 19:43. 19.37 A large group of pro-Ukrainian activists is going to the left (Southern) wing and break in the side door. The attackers in the presence of journalists and streamers are trying to knock down the doors of the rooms and the 1st floor and walking out a woman from one of the rooms. People on the second floor of the lateral wing resist and use Molotov cocktails inside the building. 19.40 Violent clashes between football fans, pro-Ukrainian activists from one side and people inside the building situated close to the central entrance, from the other side, begin. Both parties are using Molotov Cocktails, Kulikovo Field activists are throwing bottles with incendiary mixtures from the rooftop and a lobby on the first floor. Those Kulikovo Field supporters who defend the barricade, gradually retreat to the lobby. They hastily build barricades from pallets, furniture and other items in order to block the entrance doors to the side wings so the big barricade is growing in the lobby in front of the central entrance to the building. Pro-Ukrainian activists are throwing bottles at steps of the entrance, in the lobby and into the windows of the building , including those where active fire positions are located and where unknown people are firing from. 19.40 A group of pro-Ukrainian activists is hiding behind a fence from the backside of the building, is trying to get into the courtyard through the sliding gates. In response to that shots being heard, presumably from the roof and stairway windows in the southern wing of the building. From the words of witnesses, one of the pro-Ukrainian activists gets shot in a leg. Storming attempt has failed. 19.43 A man in a blue shirt and bulletproof vest identified as «Centurion Mikola (Nikolai Volkov), is shooting at the central window on the 3rd floor from the right-hand (northern) side of the building from which someone is throwing firecrackers. 19.44 City Emergency Services Duty operator of Department of Internal Affairs reports to the City Emergency Services about the urgent need to send fine engines to the Kulikovo Field. Employees of the City Emergency Services ignore this message. 19.45 The first message about fire in Trade Unions building arrives at the telephone service 101. Fire begins from the bottles thrown into the window at the second floor. At the same time fire begins on the left side of lobby. First phase of the fire starts. 19.46 Policemen in protective gear appear at Kulikovo Field close to Trade Unions building. However, they don’t take actions to interfere the events. 19.47 There is a shooting being heard from the left side wing (south of the building). It is a single fire, with 15 shots during 10 seconds. 19.49 Pro-Ukrainian activists are squeezing out Kulikovo Field supporters from the porch to the inside of the building. One of them is throwing burning tyre into the central entrance of Trade Unions building. 19.50 Reflection of flames behind the closed window inside the room at the second floor can be seen at the video. Subsequent inspection of the building by members of “2nd of May Group” didn’t find any fire or signs of fire in the room outside the window. 19.51 Five pro-Ukrainian activists who had previousøy entered the “green hall” of Trade Unions building, appear to be blocked with smoke and fire. They are preparing for evacuation through the window and calling for help on the phone. 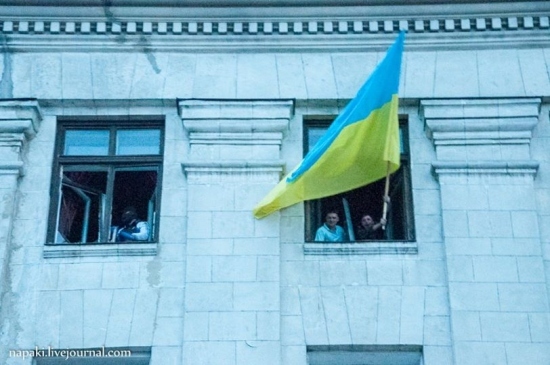 In order to indicate their location, they put out Ukrainian flag from the window. 19.52 There are 6 calls concerning fire received in the duty unit of the City Emergency Services. Among calls there is a call from «The board of public safety » (Zhukovskogo street, 36). 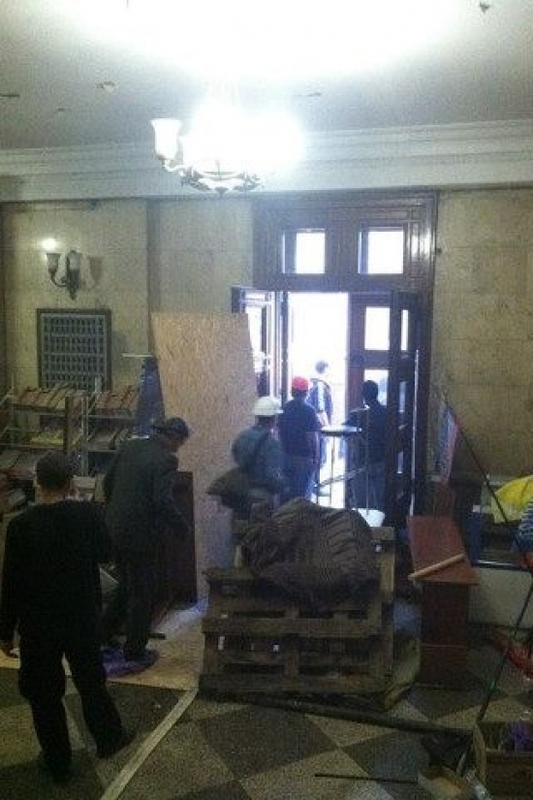 19.52 Barricade in the hall next to the entrance at the 1st floor begins to burn. All three doors of the central entrance to the building being to burn. Fire is spreading to the further part of the hall, towards the main staircase. 19.53 There is a smoke coming out from the open and broken windows of the façade of the building. 19.54 The second phase of a fire begins. There is a strong fire in the first floor stairwell area. The temperature in the staircase areas and on the floors is quickly increasing to hundreds degrees; people near windows start to jump out. In a matter of seconds the fire completely covers the stairwells and the pad between the first and second floor. There is a strong ignition occurs in the area of stairways at the back side of the building. The temperature reaches 600 degrees at the ground level and 200-250 degrees on a ladder and the pad of the 5th floor. At least 10 people are falling and jumping out from the windows in staircase areas within minutes. At the moment when smoke spreads around, one of the attackers is running closer to the building and causing a few strokes with a stick to a person who just jumped out of the window- a man in a white shirt, grey jacket and dark trousers, who is lying at the ground at that minute. A man is moving while being stroked, he is alive. “2nd of May Group” could not identify him and the results the damage he had, until now. Since the inception of smoke a few dozens of pro-Ukrainian activists, policemen and interior troops soldiers begin to bring out wounded people and dead bodies away from the dangerous zone. Ambulance and paramedic brigades are working at the alley from the backside of the building. 19.56 Duty operator of Department of Internal Affairs redials again to the City Emergency Services about the urgent need to send fine engines to the Kulikovo Field. Finally employee of City Emergency Service commands the immediate departure of firefighters from the Duty Fire Department-2 (Privokzalniy Lane, 2 which is situation only 500 meters away from Kulikovo Field). 19.58 There are another 4 reports received on the emergency telephone number 101, including a call from the Duty officer from City Police Department. Calling people tell about people that are jumping out of the burning building. 19.59 People in smoky rooms at 2nd and 3rd floors of the front part of the building (7-11 metres above ground level) appear in the windows and asking for help. Evromaidan activists are trying to throw ropes up to reach them and collect any items for evacuation. Storming of the burning building stops. 20.06 Evacuation of people from the front side of the building begins. People continue throwing rocks, pieces of glass and different things from the rooftop of the building which makes evacuation more difficult. Those who are inside the building continue to use firearms. Euromaidan activist Andrey Krasilnikov who was at the right side of the façade, has been injured with a bullet calibre 12 fired from a hunting gun which someone was using to shoot from one of the windows inside the Trade Unions building. 20.08 People at the rooftop continue throwing down rocks and different things. Equipped officers of special police unit which belongs to Regional Police Department, appear at the square in front of the building. They banish pro- Ukrainian activists from the right side of the façade and build a cordon. Duty person in the State City Emergency Services gives an indication to the Fire Department-7 (Prohorovskaya street, 6) to send one tank of water at Kulikovo Field 1, and to the Fire Department-3 (Staroportofrankovskaya, 1) about providing of a fire staircase. 20.09 According to a report of the State City Emergency Services, the first fire engine arrives from the rear side of the Trade Unions building. 20.11 Pro-Ukrainian activists are pulling metallic constructions left after the concert stage which was at Kulikovo Field previously and put them upon the wall of the building. They put first such construction from the left-hand side, afterwards another construction from the right-hand side and at the central entrance. They are high enough to reach the second floor which significantly simplifies the evacuation of people from the parapet and windows. 20.14 The first fire truck is arriving. 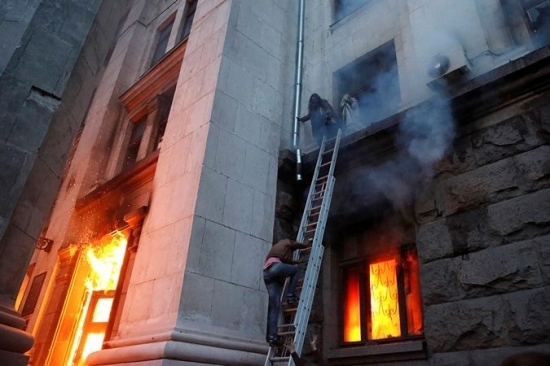 20.17 Five football fans blocked with fire and smoke in the «green hall» are indicating their presence again by waving Ukrainian flag from the window at the fourth floor of the left façade wing of the Trade Unions building. 20.18 Second fire engine arrives. Activists are removing fragments of ladders from the vehicle and set them on top of the structure near the wall on the left side of the façade. It makes evacuaton of people from the left (South) side of the 3 floors of the building possible. 20.19 Firefighters are using sliding stairs to evacuate people from smoky rooms on the second floor. By using another ladder they begin to evacuate people from central window which is located on the second floor on the left side of the façade of the building. Around 20:20 A person falls down from the cornice of the rightmost office window at the fifth floor. One more person (in the dark cloths) is walking away using cornice to the roof of the side (northern) wing of the building. A person in white shirt and dark trousers is laying down at the cornice. 20.22 Policemen with the shields are building the cordon, pushing back pro-Ukrainian activists away from the central entrance and building façade, a clash occurs. 20.23 Rescuers use fire ladder and safely evacuate a person in light shirt and dark trousers who was laying at cornice outside the building at the rightmost office window at the fifth floor. 20.24 Firefighters and pro-Ukrainian activists evacuate people who were on the third floor and in a heavily smoke filled room above the main entrance on the second floor of the building. People at the square are trying to attack them, heating them and interrogating them brutally. Police officers are trying to protect evacuated people from the lynching. 20.25 People that still remain at the 3rd floor of the burning building are calling to the hotline 101 and asking for help. 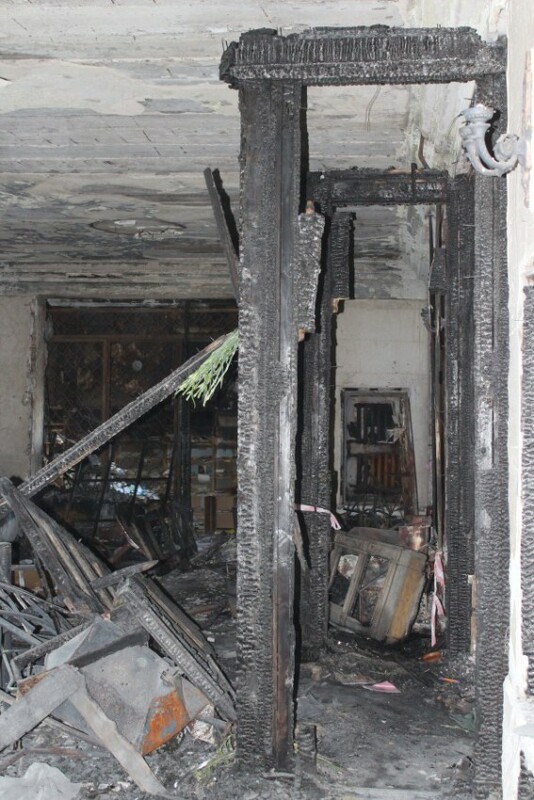 20.26 Firefighter unit stopped the fire of the entrance door of the Trade Unions building. Rescuers continue evacuating people from smoky premises. Around 20:30. A group of armed men equiped similar to SBU special subdivision «Alfa» with yellow bandages on their hands arrive in three dark blue Volkswagen minibuses at the rare side of the building. Approximately in the middle of the alley which leads from the backside of the Trade Unions building to Srednefontanskaya street, these people perform an operation similar to detention, and bring out at least one person in civilian clothes without symbolism. «Group of 2nd of May» could not identify the detainee as well as the group and its belonging to competent authorities. 20.31 Rescuers ented the Trade Unions building through the main entrance. Pro-Ukrainian activists also entering the building and as soon as the smoke dissipates, they are starting to go through the building in search of survivors. According to witnesses, they supressing attempts of people remained in building to resist, administering the first aid to them, afterwards taking them out of the building and later passing them to the police. 20.32 Firefighting units continue to arrive at Kulikovo Field. 20.35 Firefighters extinguish local fire hotspots inside the building. With the help of pompier ladder they evacuate three persons from the nearest room at the fifth floor in the inner side of the building. From the room #432 (corner office in the right-hand, northern side wing) one can hear the sounds of fighting and people shouting for help. Up to 20.37 There are four messages about the fire and 22 persons remaining at the rooftop of the bulging are coming to the hotline 101. 20.37 “Self-defence” activists and police officers taking out groups of people who were located in the northern side wing of the building and who were not affected by the fire. They are trying to defend evacuated people from the aggression of chaotic groups of activists outside. 20.38 Trade Unions building (“red hall”, northern side of the building) In the window of the “Red Hall” adjacent to the Cabinet № 432 Ukrainian flag appears. 20.40 Trade Unions building Ambulance and police reinforcements arrive to the Trade Unions building. Policemen are trying to build the cordon around the backyard gates of the building. Evacuation of people continues at the front side of the building. One of the evacuees has an object which looks like a smooth-bore shotgun. Object was removed and transferred to the police. 20.45 Near the backyard gates pro-Ukrainian activists are forming a ring which surrounds Alexey Albu and Vladislav Wojciechowski who just came out of the building. 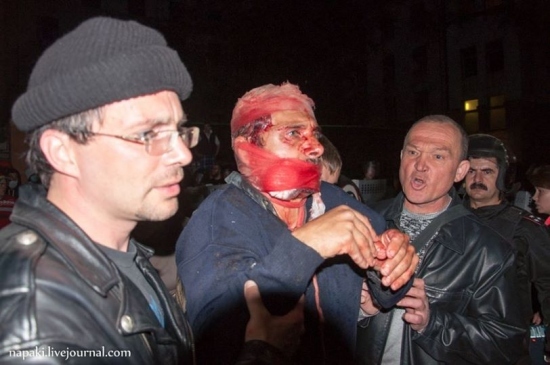 Pro-Ukrainian activists around ransack them, interrogate and hit them. 20.50 According to the report of the State City Emergency Services, the fire is extinguished. The rescuers continue chocking the fire locally, particularly the staircases between 3rd and 4th floors. 20.53 There are around 12 persons appear to be inside the ring, they were beaten. Paramedics administer them the first aid. There are more Kulikovo Field activists been brought out from the building and people that gathered at the square also beat them. Seriously injured people are taken away by ambulances. 20.59 Police officers organized a corridor and at least five paddy wagons arrive to take away people from the rare side of the building. 21.05 Evacuation of critically injured people continue. There is one pro-ukrainain activist with injuries among them. 21.07 Firefighters report to journalists about 20-30 dead bodies inside the building. 21.15 Pro-Ukrainian activists, journalists and “streamers” counted about thirty people who died in fire inside the building. 21.24 Rescuers of the State City Emergency Services strengthen Ukraine’s flag and the flag of Odessa at the flagpole in front of the Trade Unions building. 21.45 Policemen, military men of internal armies and “Self-defence” activists are forming a corridor from the back side of the building all the way to the paddy wagons, allowing Kulikovo Field activists to leave the building relatively safe. 22.03 Firefighters clean building with water from the inside to extinguish local fire spots, in particular, on the stairway between the 3rd and 4th floors. Around 22.10 Pro-Ukrainian activists from Odessa and Mykolaiv groups of “Self-defence” are going to 411 Waterside Squadron Memorial on the outskirts of Odessa by buses, where the tent city of “Odessa squads” was situated before moving to the Kulikovo field. There they detained several young people, call their parents and release them after conversation. Around 23.00 Experts of the Odessa Regional Bureau of forensic medical examination start inspecting bodies, located near the Trade Unions building. 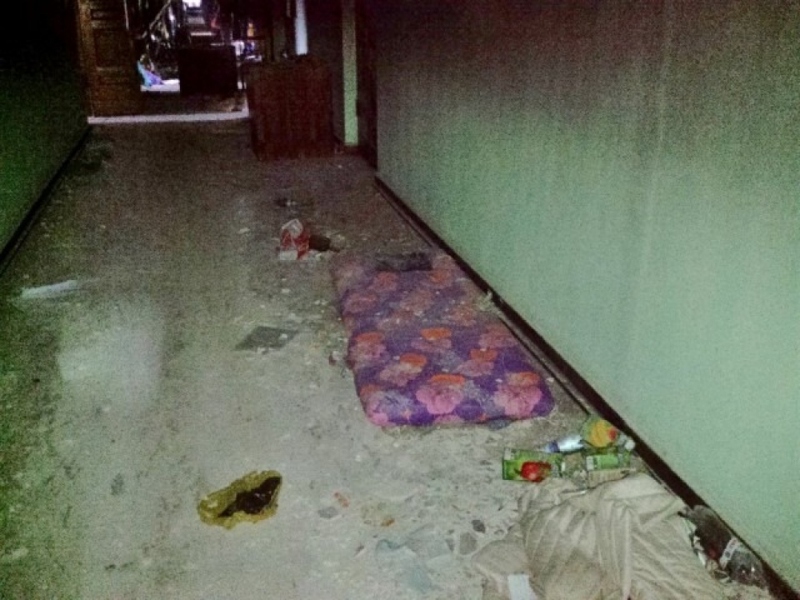 Around 02.00 Experts complete inspection of the bodies outside the building. Around 04.00 After the long negotiations, police evacuated about 45 people from the roof of the building. Last small group hid in the attic and went down by themselves on the 3rd of May in the morning. 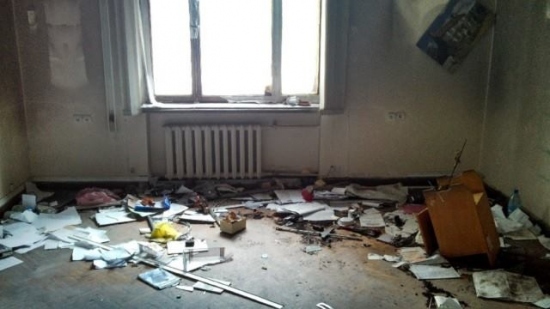 Around 09.00 Experts of the Odessa Regional Bureau of forensic medical examination begin an examination of the bodies inside the Trade Unions building. Inspection gets interrupted several times for security reasons. There are negotiations occurs with the Kulikovo Field supporters who still remain blocked in the building. Around 10.00 Police is bringing out the last group of Kulikovo Field supporters (5 people). Around 15.00 Forensic experts complete their work inside the building. During the day on 3rd of May investigatory-operative Group of Regional Police Department and forensic experts work inside the Trade Unions building. 04.05.2014 Free access to the Trade Unions building opens for everyone. 20.05.2014 Trade Unions building is surrounded by a fence, free access to the central part of the building is prohibited. 1. Analyzing the events on the Kulikovo Field, the group did not reveal cases of obstructing the work of fire brigades andambulance crews. 2. The Group has not identified cases of denial of medical care, including politically motivated. 3. There were hospitalized several dozen people from Kulikova field? 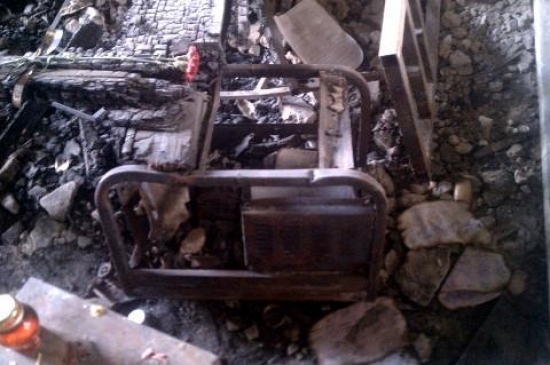 who were injured with gunshot wounds, thermal burnsand poisoning by combustion products. According to available information,one person died as a result of internal injuries andinternal bleeding when jumping from a height of about 5 meters, two died from burns.This may indicate that the vast majority ofsupport from the doctors and paramedics has been qualified and timely. 4. There are unverified data that the inspection powers euromaidan have three people who were evacuated from the building,were seized mobile phones and valuables. They were noted several cases of looting, theft of valuable office equipment and vandalism in the he building of the House of Trade Unions.To establish the status of individuals who committed these acts, to a certain side of the conflict to date failed. Under the terms «Antimaidan» and «Kulikovo Field» we mean organizations and individuals who share the idea of federalization of Ukraine and / or the creation on its territory as an independent public entities and / or changes of the external borders of the state, and support the actions of activists of the tent camp, which was located on the area of Kulikovo field in Odessa in February-April 2014. The term «euromaidan» the authors refer to organizations and individuals who are supporters of a unitary system and / or the European integration of Ukraine and / or maintain the external borders of the state unchanged and support the actions of the activists — participants of mass protests («Independence Square») 2013-2014 years in Kiev and Odessa. Under the term «ultras» authors indicate the informal group of the most active football fans.